Start loving your daily drive with our One Owner 2017 Nissan Altima 2.5 SL Sedan that's sculpted to perfection in Brilliant Silver! Powered by an efficient 2.5 Liter 4 Cylinder that offers 180hp while paired with an innovative Xtronic CVT. This Front Wheel Drive is ready for anything mother nature has to offer and delivers efficiency without sacrificing performance so you can score 39mpg while enjoying a brilliant drive. Our dramatically-styled Altima 2.5 SL slips through the air with ease and makes a lasting impression with its sculpted lines and classically elegant profile accented by the beautiful aluminum alloy wheels and chiseled curves. Step inside the cabin of this Altima 2.5 SL and you will notice the interior is spacious and thoughtfully designed to meet your demands. Enjoy the abundance of features including dual-zone automatic climate control, leather-appointed seats, heated front seats and and a heated leather-wrapped steering wheel with mounted controls, the Advanced Drive-Assist Display, Bluetooth, an illuminated USB connection port, and Bose premium audio with a color display and available SiriusXM radio so you can jam out to your favorite songs on the go! 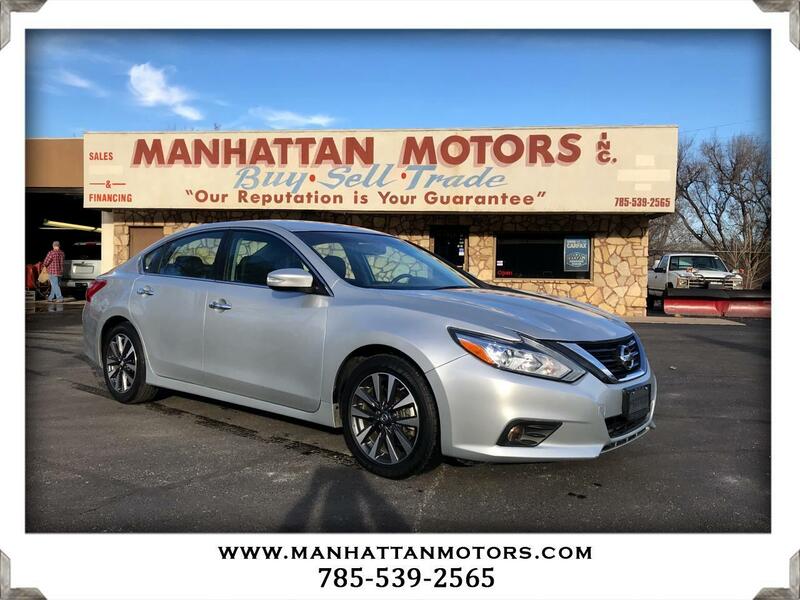 A Top Safety Pick, our Nissan Altima provides ultimate peace of mind with a multitude of safety features such as tire pressure monitoring, a rear view camera, blind spot warning, vehicle dynamic control, traction control, and advanced airbags. Slide behind the wheel of this beautiful sedan and get inspired! Print this page and call us Now... We Know You Will Enjoy Your Test Drive Towards Ownership! Thanks for choosing Manhattan Motors. We recently won The Manhattan Mercury Readers' Choice Award for being the #1 Used Car Dealer. Buyers enjoy our "laid back" approach. No test drive routes or high-pressure salesmen. Our focus is to offer all of the information you need to help make the best decision for your family or business. Each one of our vehicles undergoes a 30-point vehicle inspection by Burnett Automotive, Manhattan's #1 Auto Service Facility. We are also the area's only Independent USAA Certified Dealer, offering discounts on purchases and interest rates.